MADRID, Spain — CNN reported that Judge Luis Alaez Legeren, who is overseeing an investigation into a train accident in Spain last month, presented preliminary charges against Adif, the state-run rail infrastructure company. The attention has focused until now on the driver of the train, which derailed near the northwestern city of Santiago de Compostela, killing 79 people and injuring many more. Francisco Jose Garzon faces 79 counts of homicide and an undetermined number of counts of causing injury by professional recklessness. 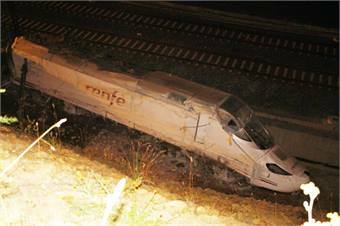 However, preliminary charges have now also been filed by the judge against "the person or persons from ADIF responsible for the traffic safety in the stretch of the rail line between the stations of Ourense and Santiago on July 24," according to documents posted on a court website Tuesday, the news outlet reported. For the full story, click here.